Chelsea Winger Willian has spoken about his likely transfer to Manchester United in the next coming transfer window. Jose Mourinho 'Manchester United' boss is a huge admirer of the Chelsea winger, who he worked with at Stamford Bridge. Manchester United have been monitoring the Chelsea man throughout this season and The Sun has reported that a deal is likely to be struck this summer. Though Willian current contract at Chelsea does not expire until 2020 and is not sure if the Club will like to sell their star man to a rival. "He likes me a lot and I like him a lot as a coach and as a person. He has put his trust in me and in my work, and I was very grateful to him." "Manchester United came to me, they talked with my agent, but nothing happened, because Chelsea would not negotiate me in any way and I'm very happy at Chelsea." Meanwhile, Willian transfer might affect Juan Mata at Manchester United as he has failed to earn a regular spot under Mourinho. 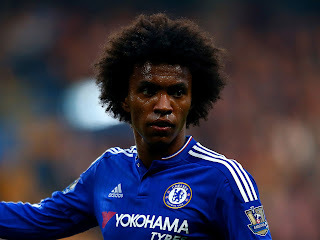 Do you think Willian should leave Chelsea and sign for United?